Los Angeles: J. Paul Getty Museum, 2011. 128pp. $14.95. ISBN 9781606060766. Fiore dei Liberi’s Fior di Battaglia (‘The Flower of Battle’) remains one of the most important texts for fight scholars today. The teachings of Fiore, along with those of his German contemporary Johannes Liechtenauer, form the bedrock of our understanding of medieval combat. His techniques were preserved and adapted down through the centuries in the various schools of arms that operated throughout what is today Italy. But he was not the founder of an Italian school. Fiore’s school was instead his distillation of techniques learned through years of practice and training with masters from all over Europe. To date, four manuscripts have been found to have survived, and there are references in other sources to additional copies that, sadly, may not have. Of them, MS Ludwig XV 13, preserved at the Getty Museum in Los Angeles, is the copy that fight scholar Ken Mondschein showcases in this beautiful volume. The Knightly Art of Battle is not, it must be made clear, an edition or interpretation of the text. Rather, to borrow an appropriate term from the back cover, it ‘celebrates’ the Getty manuscript as a whole. The book offers readers a glimpse at the finest example of all the surviving Fiore manuscripts, including the story of its author, the exquisite illustrations, and the brutally effective techniques taught within. All of this is complemented by Mondschein’s insightful commentary. What first strikes the reader upon leafing through the book is the abundance of gorgeous imagery. Almost every page features high-resolution images of the manuscript, be they reproductions of whole pages or sections, or magnifications of the drawings so high one can literally make out the irregular texture of the page, ink, and gold leaf. For those of us who have never had the opportunity to view the Getty manuscript in the flesh, and have contented ourselves with low-quality images that were sufficient for the task, the images in this volume are a rare and welcome treat. They help you to truly appreciate the detail and sophistication of the drawings themselves (which, some claim, were copied from originals executed by Fiore himself). The illustrations in the Getty MS are invaluable for several reasons. They are, first off, superior examples of the manuscript illustrator’s art. For medievalists in general, and arms and armour scholars in particular, the representations of arms and armour from the late 14th and early 15th centuries found in the manuscript, which are quite diverse in style and design, are of tremendous value. Lastly, and for fight scholars most importantly, the detailed depictions of combat techniques are executed with such a degree of realism that the figures seem to be in dynamic motion. The attention to anatomical detail and positioning has greatly enhanced the ability of fight scholars to experiment with these techniques. Do not let the comparative lack of text convince you that this volume is little more than a coffee-table book. As the primary focus of this work seems to have been fostering an appreciation for this extraordinary artefact, the author and editors have given ample room for allowing the manuscript to speak for itself, and rightly so. However, brevity being the soul of wit, the text with which Mondschein has chosen to embellish this display of the manuscript’s high points is well researched and most informative. Mondschein’s introduction strikes a good balance between presenting a satisfactory amount of information and inspiring those who are more interested to go off and explore further on their own. His description of the manuscript is thorough and conveys all the useful data that a codicologist requires. He also discusses what little is known of Fiore himself, and the ‘fight culture’ to which Fiore was both a participant and a key contributor. 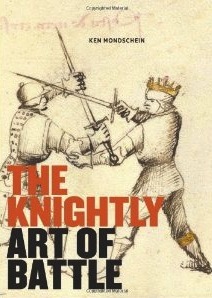 He also shows the reader how best to approach the text: not as a ‘how-to’ manual, but as a reference guide and catalogue of the combat techniques that demonstrated Fiore’s mastery of his art. The chapters are divided up by the techniques covered in the text: wrestling, dagger (although, perplexingly, it is titled ‘Self-Defense’), sword, fighting in armour, hafted weapons, mounted combat, and the odd array of improvised or unconventional weapons of which Fiore was an advocate. Each chapter is given a brief introduction, and the proceeding text consists of captions of varying length to the full-page illustrations. A great deal of information is packed into these captions, including analyses of the illustrations and interpretations of the techniques. While Mondschein does make a point of translating the names for the positions and techniques depicted, this is the extent of the manuscript’s text that is put forward to us. Given the chosen format for the volume, it is understandable that translating large blocks of the text was not practical or desirable. However, a few choice instances of being able to hear Fiore’s own words, which were often both witty and brutally practical, delivering some of his teachings would have enhanced the experience of reading that much more. There are simply not enough books out there that deal with Fiore and his lineage. Compared to the volumes that cover the schools of fence that flourished around the same time in the German-speaking lands, published works on Fiore have a lot of catching up to do. This is why it is such a joy to see a book like Mondschein’s enter the field. Editions and interpretations of fight manuals are valuable sources for fight scholars, and we all eagerly anticipate future work of this type that Mondschein will undertake in due course. However, The Knightly Art of Battle is equally important for different reasons. It is, in a manner of speaking, an emissary; a means of introducing a wider audience than the just the small community of fight scholars and Western Martial Arts practitioners to this remarkable manuscript. Fight manuals are objects that lend themselves well to interdisciplinary study. Because it is presented in this way, art historians and manuscript specialists can also be drawn into the conversation by having a book that caters to their interests in such a text as well. As a work that seeks to promote a greater awareness of such an extraordinary and important object as the Getty manuscript, The Knightly Art of Battle is to be applauded for its success. This entry was posted in BookReview and tagged arms&armour, manuscripts. Bookmark the permalink.